The following files are mostly on a Yahoo site which requires that you sign in. Summaries are quick & impressionistic. Improvements to these summaries, & more documents are welcome. Charles Town sewage plant is limited to 1.2 mgd and has only 150,000 gallons per day remaining capacity. Sewer plant design manual update. Purpose is to show plant can treat 1.2mgd at up to 500 mg/L BOD. (Average is 534, with 5 of 60 samples > 900. Average excluding those is 486.). Were taking samples at bottom of influent channel; will start taking them 3-4" up. Average flow in 2003 was 1.15mgd. Plant designed by Sanitaire Corp. In storms it can process a batch of sewage every 2 hours, totalling 3mgd. Limit is capacity of blowers to force air through the 3 treatment basins. State is concerned about treatment capacity & seeks revised schedule. Asks for copy of legal opinion. Reply to 12/3/03 letter. Please ignore BOD coming into plant. Just look at effluent. But ignore recent effluent pollution, because a bacteria caused it. Feeling frustrated. draft of letter saying treatment capacity is unknown. Weekend flows higher in June. Permit violations 7/03 & 8/03. but still claim "consistently meeting permit limits" in 6/03-8/03. Reply to 12/3/03 letter. Houses will reduce concentration of pollutants. Will add chemicals to minimize odors. Schedule. 2003-2023 projections of sewage flow. List of subdivisions & start dates. Sewage plant virtually full. Pollution violations. Cannot approve more subdivisions. Proposed sewage plant on Flowing Springs/Cattail/Shenandoah too expensive. Should expand Charles Town plant. copy of same letter, emailed by Kevin Lilly -DEP to Raco -County. Sewage plant virtually full. Pollution violations. Cannot approve more subdivisions. 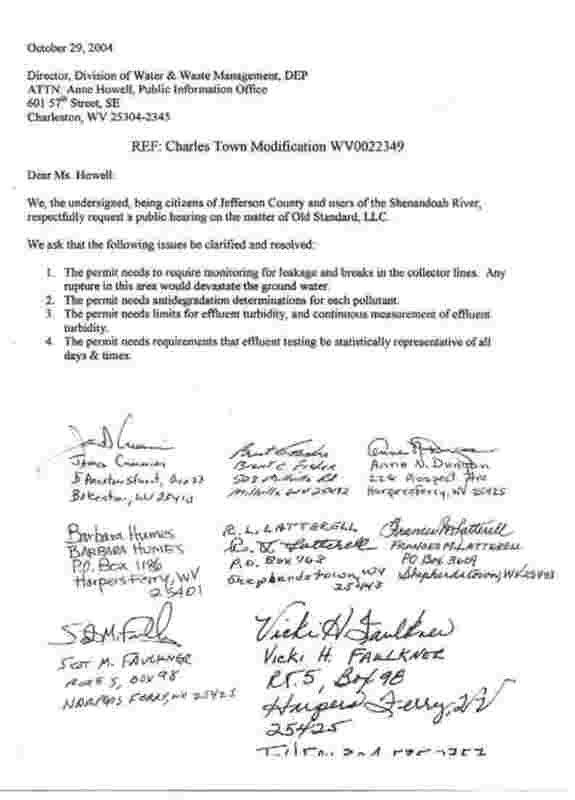 final copy of letter saying treatment capacity is unknown. Weekend flows higher in June. Permit violations 7/03 & 8/03. but still claim "consistently meeting permit limits" in 6/03-8/03. Asks what is capacity of Charles Town & what is it processing. Johnson -DEP, Mallory -Infrastructure Council, Swann -PSC, Legg -BPH? Briar Run subdivision sewage pipes on hold.